Red is said to be a color of fire; it represents passion and loves; it is used to be highly famous among women because it enhances their attractiveness even more but nowadays mens also considering the apparels in this. 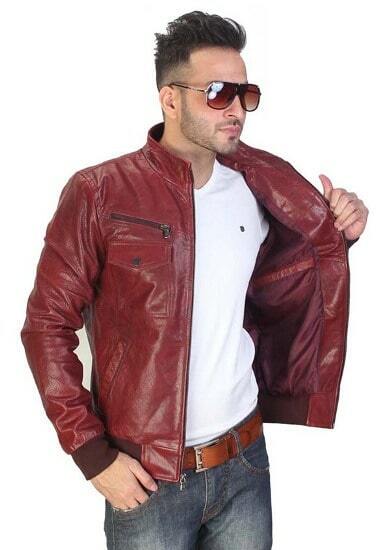 If you want to look hot, then the leather jacket of this color is a Red-hot option for you. LOOK STYLISH IN RED LEATHER JACKET - HERE'S HOW! Today, there are many different types and colors of leather jackets available in the market such as black ,red leather jacket outfit and more! Still, people do require a great guidance to work with. However, red leather jackets has always been the most demanding winter outerwear these days. You will find many different stores and outlets selling these variations but only few are willing to provide you good quality. This guide of red leather jackets is classified for both men and women in five different classes that will surely help. Here you will know how many styles are available and which one will give you a heroic look. 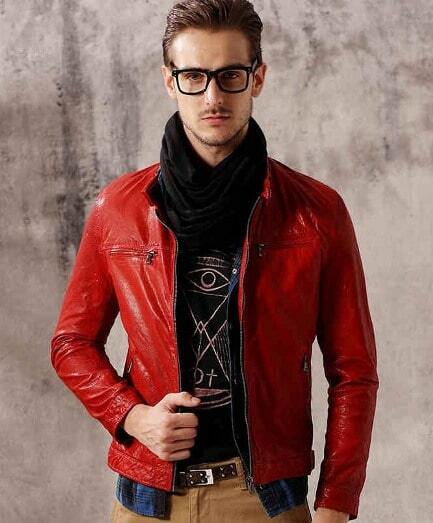 Here is a model wearing mens red leather jacket with other stuff like T-shirt, Jeans and Belt. It looks more of a Bomber style but with stand-up collar. You won’t usually find like this because traditional ones have rib knit on cuffs, on the waistline and collar but in this case, it’s different. The model combined his outfit with blue denim jeans, white round collar shirt, brown belt and reddish shades. For shoes, a pair of long black boots or red joggers will be a perfect match to complete the outfit. But last and the most important thing is how cool he's looking in the red leather jacket mens. Every guy would definitely love to attire like him, or you can replace some of the stuff like the color of jeans and t-shirt or introduce wristwatch to create a more appealing personality. That was we talking about red leather jacket men but what about women? They also want to look stunning in their routine life, and red color plays an essential part in their fashion. Here is a model styling in a womens red leather jacket that can be traditionally called bikers style. Along with the outerwear, she has worn grey long V-Neck Tee with black tights that match her personality. However, she is not wearing too much stuff like a wristwatch, shades or bracelets that women usually wears but a sober person prefers to wear fewer accessories. Also, shoes are most important and you never want to go out without wearing matching sandals! You should definitely pick shoes, and the most preferred color is black that goes with red leather jacket womens. The next stop is for the Formal look! Well, usually people wear suits and blazers for their formal look, but here it can be changed into a leather. They prefer to wear mens red leather jacket for formal and office look instead of suits. This time, the model is styled with some adjustments in his accessories. He has worn his Jacket with a checkered shirt, black printed T-shirt, and black muffler. The guy also has used transparent shades and khaki color cotton pant. The featured idea can also be worn on other occasions where people will find you entirely different and attractive than others. But all ends in the look of the red leather jacket men. It’s making the model look bold and attractive! 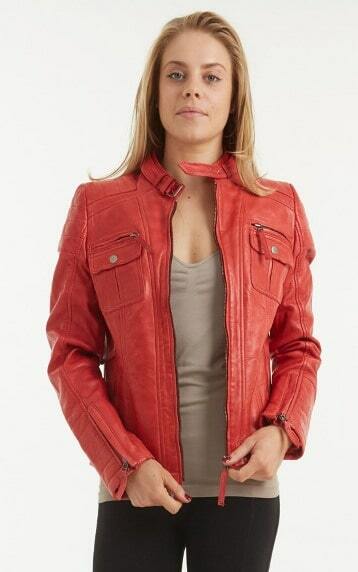 Women can also have their formal look by wearing stunning girls red leather jacket. It’s as simple as you can see in the image where the model has worn completely different outfit than the casual one. Apart from her glasses, beautiful earring, black skirt and other accessories, her jacket is the main attraction. You can use this kind of outfit for almost every occasion. A little bit of altering and you’re ready to go! This outfit is also preferred for theme parties such as Valentine's Day where Red is compulsory. 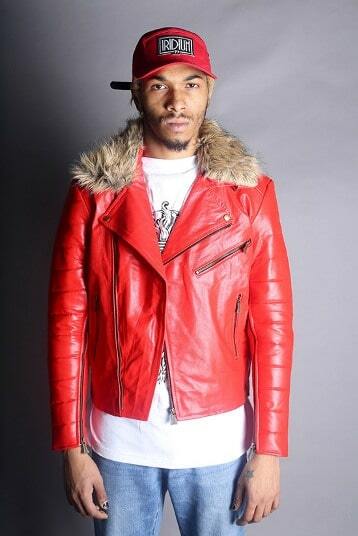 Men and Boys red leather jacket comes with few alterations the addition of shearling. Many manufacturers have added shearling lining which is a good insulator and keeps you warm in winter while the temperature is in negative out. The above model is portraying the same style in a decent look by wearing an outfit that has shearling lining on the collar and t-shirt was preferred underneath. Along with T Shirt, the look of the jacket is completed with matching jeans and cap. Similarly, women are also wearing the jacket with shearling lining on the collar. It is moslty for winter and no doubt, the model is looking stunning in it and so can you! One thing we notice is the entire above models are wearing blue denim with her leather jacket. It clears that with your red leather jacket womens or men goes perfect with denim jeans. Let’s twist the things from models to superheroes! After all, they are the one to introduce such awesome wear for you! 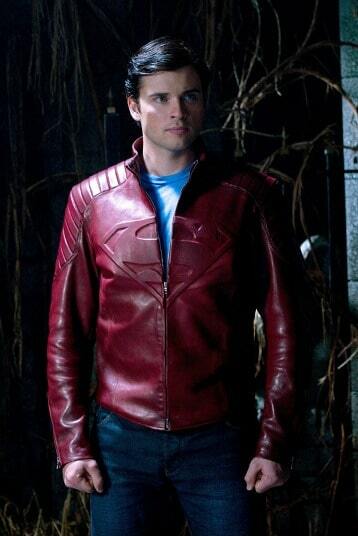 Check out characters like Tom Welling in his Superman Red Jacket (famously known as Smallville Jackets). For people who are insane about Superheroes, they can wear this outfit with their daily fashion such as blue jeans or tees. What makes it a unique pick is the S logo on the chest that portrays it as Superman Jacket. Scarlet Witch jacket is truly an excellent choice that people don’t commonly see. It has blackish shade on it and designed entirely sober. For girls, who wish to wear the leather jacket and style like a superhero, Scarlet Witch is the best example for all those women. Now you have the idea how you can classify red leather jackets and combine it to have glamorous look. 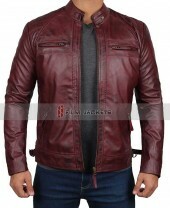 Fjackets is making celebrities outfits and offering best discount on each product. Decide which style you’re willing to have and order it when you find your choice.